Sharing my adventures in the Dominican Republic! Or how a a mission trip to a third world country changed my life.......step by step, day by day. Oh my goodness! One day little 4 year old Brendita came over the my house with a dolly. I'd never seen her with a toy so I looked closely at what she was carrying. Lovingly held in her arms was a nekkid and headless little doll. She carried her baby doll with her where ever she went. No one knew whathappened to the head, but it didnt seem to bother Brendita at all. Later in the week down a long dusty road we saw a little girl playing with the head of Brendita's doll...........Both seem content with the piece of the toy the lovingly carried. Makes you stop and appreciate all God has placed in our hands. 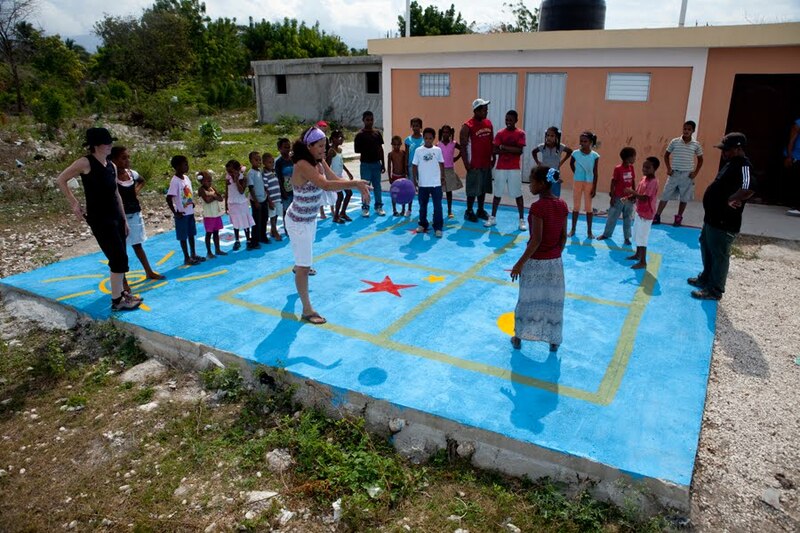 During the mission trip Dana, Liz and Eileen turned two cement slabs into happy play grounds. Amazing what a couple of gallons of paint can do. These children love and appreciate the simple things! Thank God for willing hearts and helping hands! Finally Blogging The Last Mission Trip! Good grief! Where did the time go? I've been home over a month now and this is the first change to blog. We are living life at the speed of light right now. After I returned home I moved into a bit larger home because I am getting married in June. When we finally get married and live together we'll need more space that is for sure. Combining two households has reminded me of how many "things" we have in our lives. "Things" we don't always need, we just collect. And so on that note I'm going to introduce to a little five year old girl named Benita. The village of Habanero is located 65 miles from the Haitian border. Our village is comprised of Dominicans and Haitians. Benita and her father came to the Dominican looking for work, they were found sleeping by the river. They speak Creole and only a little Spanish so we don't know a lot about their background. This much we know, the came alone barefoot and with just the clothes on their backs. After a couple of weeks of living on handouts, Benita's father gave her to a Dominican family and he left. I never saw her while the Mission team was there. after all the Americans left I noticed her sitting alone on the porch, never interacting with others, always alone. She wasn't going to school and I learned she was sleeping on a concrete floor. A child in Benita's situation would be raised subservient to the Dominican family. Almost a slave to them. I could see this was happening to Benita already. I went to the house to see her one day and she was sick with fever. I asked the family if I could take her to my house for a few days. That night at my house I saw bite marks on her back from the older children. The next day we went to Barahona, purchased medicine, a new school uniform, socks and shoes. Benita and I spent the next five days together while she recuperated. It was hard to take her back home, but I knew it was only for a short time. I'd already had a goal of moving her to our head teachers house. I just learned a couple days ago Benita is with Yaneth in a loving Christian home where she will be treated as a member of the family. Thanks to our Board of Directors we are committed to help support Benita every month. Notice how very proud she is wearing her new uniform ready for her first day of school. Praise God we were there and are equipped to help this child. My part, well, I'm going through every box we moved her and preparing to have a garage sale. That garage sale money is going to be used for Benita's care. Along with another family's care, but that's another blog. Evergreen4kids is a 501(c)3 non-profit helping destitute children in the Dominican Republic. We built and fund a school for 80 children ages 3 through 8 years old. We provide clean water, vitamins, education, one meal a day, school uniforms, medical and dental care. Join us on a Mission Trip - it will be an experience you will never forget.